Suldove Ravadove stands almost 6 foot through several of those inches could be perceived as from her dreads. Think, long, sunkissed blonde hair that is twisted and braided into rope-like dreads and tied to form a ponytail that flows off the back of her head. Her eyes are a cool blue and she glances about with an almost feral look. 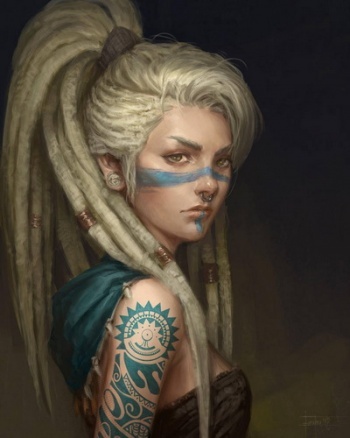 Upon her face, neck, and shoulders are tribal marks in the sacred blue that denotes she was taking in a battle against Jechran, her worth to the tribe, and that she earned membership in the Blue Fox tribe of Tyedu. When she speaks it's in a mix of broken common with a mix of Tyeduian and Jechran accents to her words. In the spring of her eighth year is when life takes a turn for the worse and Suldove on a path she could not turn away from. In that spring with the Blue Foxes of Tyedu starting their raids against Jechran lands protected by the Blood Wings. Wolsuldove, for the first time, allowed the twins to travel with the warriors as part of the support followers to remind her why she fights. Everything went as it always does. Blue Foxes push and gain ground and the Blood WIngs would push them back across the border then retreat into Jechran. Until the battle of Thick Trees along the borderlands with Tied. Unknown to Wolsuldove and her warriors was the alliance the Blue Foxes had with a band of outcast and criminals of various tribes of Tyedu; only known as 'The Circle'. As the Blood Wings held the line against the Blue Foxes. Was when The Circle moved against the flank and attacked the camp. Completely catching them off guard. The few guards were sained without honor and soon the camp it set was taken. Almost everyone killed or taken. The guard of Wolsuldove's children fought to the end protecting the children. Ravadove, being the braver of the picked up the fallen guard's' sword and as she tried to lift it up. Was punched so hard that she died then and there. Suldove was taken by The Circle as a prize. Later she was traded to Blue Foxes with the promise that when came of age. She would be offered to the leader of The Circle to bond the Blue Foxes and the ally. For years she was beaten, forced, and enslaved by the Blue Foxes as resisted their ways and tried often to escape. For which she was hobbled on more than once. In her tenth year, while collecting wood for the hearths in a small grove of trees. The figure of a woman appeared and told her to submit and learn, survive and I'll come for you. Then vanished behind a tree. From that day and the eight years that followed. She submitted, she learned their ways, their words, their tactics, and earned their trust. By her twelfth year, she was accepted as Blue Fox and marked along her face, neck, and shoulder as a true member to celebrate the day of her taken. She was passed from family to family, to gather for and to learn from, to prepare her for life in the harshness of Tied. Upon her sixteenth year, she was given a bow and quiver and taught to hunt. Which is excelled at as it gave her time away from the tribe she was disgusted at embracing and would search for the woman that spoke to her all those years ago. Upon her seventeenth year, the agreement was made that at first snow of the fall, she would be given to Asema of The Circle to bond the two into one tribe. That year was the most worrisome for young Suldove. She constantly searched for the woman and even tried to plan her own escape. Twice even considered ended it all so her future wouldn't be what they wanted it to but she would hear those words from the woman in her darkest hours. As the short summer ended, the lands were hit with furious storms and it appeared that autumn was not to be as the snow was on the way. The Circle appeared in the camp the next day with talk of bonding and belonging; a great celebration was in the works. Suldove was presented wearing a lovely fur from Asema and then ushered back to her tent. That night the storm hit hard, wind and snow came from all over. Everyone was in their tents seeking shelter from the elements. As Suldove sat watching her own little fire and coming to terms with her new life. The woman appeared from across the fire. Told her to leave everything that wouldn't keep her warm; daughter of my daughter. Together they stepped out in the storm and left the village unseen. As the storm covered their tracks. For days they walked with hardly a word said. Days blended together and rarely stopping for long as they walked easterly. Finally, trees started appearing more often and a storm was waking. Even she knows the home was close. As they neared the border the woman told her that things had changed, daughter of my daughter but from here one has a chance. Then she vanished as Suldove turn to see around at the sounds of footsteps. Four heavily armed women in heavy purple armor were walking up and demanding to know who she is. She shouted she Suldove, daughter of Wolsuldove of the Blood Wings. Yet they kept coming and surrounded her. They asked her again and she reached it. For which she was beaten down to her knees. The one that seemed to be leader explained that Suldove and her twin Ravadove died at the battle Thick Trees and that Wolsuldove and most of the Blood Wings died that next spring at the battle of Frozen Creek. The remaining Blood Wings were taken into the Black Leaves. As they prepared to beat her down again, one of the four shouted stop and asked her what was Wolsuldove's sword named? Suldove thought a moment then grinned before answering. She explained her mother never carried a sword but a fail she called 'Thicket' cause she had all the chains on it fashioned to look like rose thicket covered in thorns. With that, the four stepped back. Three of them walk off back into the trees and one stayed. After a long silence, that one spoke to Suldove. She explained that much has changed in along the border with Wolsuldove death. Their tribe is no more, and the few left follow another leader. She went on to explain it not safe for her, your marked up like a Blue Fox and even speak like one. Most would kill you on sight in the name of Wolsuldove. If they know you are her daughter then it will be worse. Best everyone thinks your dead already. Suldove did just that and headed south just out of sight of the Jechran border except for on the fourth night. She knew that landscape and it was Thick Trees. That night she slipped across and there on a tree was carved "here lives Suldove Ravadove, daughter of Wolsuldove, killed in combat". Without a doubt the one that had carved it was not her mother nor anyone that knew them. As she walked off she spoke to herself Suldove Ravadove over and over and decided to take her sister's name as her family name. In the hopes of living a life for her twin too. Now, in Elysia after walking all the way the south and avoiding almost everyone she saw. She has embraced her faith in Dre'Ana and found a group of women calling themselves the Warrior Maidens of Dre'Ana. Knowing her family history, this is where she belongs. Misilda had left her family's caravan with her two daughters Aruanya and Dooriya and with a child coming. She left cause her husbands had each died in needless fights leaving her with daughter and no means. Her own family would negotiate a new arranged marriage and marry her off. She didn't want this for herself nor her daughters. Hearing rumors of Jechran the middle-aged woman turned her wagon northeast and departed her family's caravan. Going wasn't easy even when they entered the lands of Deglos and Glados but they made it after months of traveling in the confines of the mountains. There as they rolled their wagon out into the light, Jechran, the land that almost seemed mythical to her but would offer her and her daughters a life of not being bartered and sold cause traditions say to. As they crossed into Jechran, they soon learn the promise of that life is there but it doesn't come easy. Those that seek it work hard, train hard and fight hard to protect it. They found themselves on the lands of the Bright Eagle clan and were allowed to stay if they worked. Which they did until the third daughter was born; Emanaia. Given she had worked hard and her knowledge of ways was vast; Masilda was and her now three children were invited to stay and in time would be allowed to join the tribe. On, Masilda's 43rd year, she hunted and took down a Jechera; rumors have it she had dug a pit and lined it with spears then let the Jechera chase her till reaching the pit where she swung across. The act of taking down a Jechera guaranteed her and her daughters would become Bright Eagle and protected. Not much is recorded of Araunya and Dooriya. Rumors cited Dooriya became a priestess of Dre'Ana and would live deeper in the wilds of Jechran at a secluded abbey. Araunya, took a breeder and became with child but she and the child died in labor. Emanaia, would become best friends with Salbellis the clan leader's daughter. They learn through the stories of the old ones of the Blood Wings; the warriors of Bright Eagles, who protect the lands from the Tyeduians and Gladoisans that did raid. Upon their eighteenth season, both Emanaia and Salbellis offered to become members and hunt the Jechera. It was said that the two left barehanded and wearing no armor but returned two weeks and some days later with meat and skins of the Jechera and each covered in blood as they smiled and held up the tooth to prove the deed. That night as the clan celebrate the return of the friends and the others that had returned earlier. Emanaia and Salbellis announced to the clan the reformation of the Blood Wings to both of their mothers' horror. They knew what it meant and what it cost but the clan was raided seasonal, their orchards and farms always near empty come fall. It was told to the clan and the clan was joyous. How could they be stopped? At their first engagement, the Blood Wings only number seven warriors. They had been tracking a small raiding party from Galdos. As they scouted out the orchard for raiding. The Blood Wings attacked unseen. Arrows from all directions and not even a warcry or shout. They took them by surprise and out of the twenty-person raiding party, they spared one heavily wounded gnome but would survive. The one that lived was probably a Knorkogack and was shocked to find out his compatriots and himself were taken down by seven teenage women warriors. They took him to their village and treated his wounds and once he was well enough to travel. They sent him back to Galdos with a message "Bright Eagles are protected by Blood Wings". So the myth would start. Emanaia and Salbellis would lead the Blood Wings in defense of the Bright Eagle lands and the border of Jechran even alongside some of the most famous clans, tribes, and houses. By the time of two friends taking their first breeders, the Blood Wings now number over forty women; who had matched strength and clashed arms with their mortal foes the Blue Foxes. Always defeating them even when things looked grim; the two would always find a way. Emania would be with child and give birth to Sarydove while Sabellis would give birth to Haphira. During this time they watched as the Blood Wings and planned the missions but would return to action helping a neighboring tribe the Night Lions. Who was raided via the sea by the Blue Foxes in a night raid that no one saw coming. The two planned to simply repeat the raid. Wich was a stunning victory and led to capture of all the Blue Foxes boats as well as a hoard of seal skins. Blood Wings suffered no losses and the Blue Foxes suffered heavy losses; including the capture of over a dozen young women and men. While being held by the Night Lions awaiting their fate. Many of the young ladies sought Dre'Ana and spoke of her. They were chained and sent away to see if such was true. While the men were branded and sent to work. In time many of the women would return not the Night Lions but the Blood Wings. Seeing women do what they did and with honor was a sight that impressed them. There would be many more battles for Emanaia and Salbellis. Is said that Emanaia never had another daughter but gave birth to four sons over the course of her life. She died in combat, fallen by a waraxe of the Blue Foxes at the Battle of Windy Fields, fighting for the Blood Wings with the Misty Moon Clan of Southen Jechran. Salbellis, would have another daughter and two sons. She saw her friend fall and was never the same again. She turned over the Blood Wings to Sarydove and took her own daughters with her Myelah. Sarydove, had inherited a windfall. Trained by her mother, fought alongside her in many battles and was ready to lead the Blood Wings. It is known her first battle was really an ambush. The Blue Foxes had snuck deep into Golden Eagle lands and were waiting for her. All that is known is that while they took her arm, she took all their lives. She survived the loss of her arm, trained herself to fight left handed with a long sword and after three winters led the Blood Wings on a mission of payback. Was said they chased the Blue Foxes from their own land and the sight of Sarydove, the One Arm at the head of the small army was their worse dream come true. Sarydove ensured the Golden Eagles and most of the borderlands with Teydu were peaceful for almost twenty-six years. Like her mother, Sarydove would fall in battle and her daughters were there; Maeradove and Rathadove were commanding the flanks of the Blood Wings as a combined Teyduian force tried to enter Jechran. In a strange and very honorable moment, after the battle which was a horrible stalemate of heavy losses and no gains; each force broke of the will to attack again. The one that fell Sarydove, returned her to Jechran to be honored. The unknown warrior was allowed to retain his axe and armor for the deed and traveled back safely to his camp. Maeradove and Rathadove would lead the Blood Wings for near some forty-nine year; almost all of it peaceful with just little skirmishes and raids. Of note; The Gold Eagles leader Esletha, the great-niece of Sabellis by her eldest sister; had yet to give birth to a daughter but had given birth to three boys. Esletha petitioned Myleah for help as she led the tribe. Which Myleah sent a quad of priestess and a breeder of great renown. For thirteen months the quad and breeder were in the main village. She had been with child sent the fifth month and all signs and omens pointed to a daughter. In a twisted fate, Esletha daughter Marriara was stillborn and given a funeral for a great hero. Two years later, the quad returned with another breeder that had blessed six other women all with daughters. Marriara was with child almost instantly and in her eight month, labor started too soon and Esletha and her daughter perished after days of labor. Maeradove would petition Myleah to absorb the Gold Eagles into the Blood Wings but was told the Blood Wings were not a tribe by a Warband. Myleah announced the Gold Eagles dead by lack of daughter. In the uncertainty that followed Maeradove and her lover, Lisvis departed for southern lands away from Jechran. Rathadove would plead with Myleah and in return, the Blood Wings were now seen as a tribe; with Rathadove as their leader. Their lands reduced by two thirds but tribute paid by the surrounding tribes for the service of seeing the border protected. Rathadove would have one daughter and no other children; Sandove. Given birth to Sandove almost took her life and since she had been blessed with a daughter, she was content. She would train Sandove in the ways of the Blood Wings as she and her sister were. Rathadove died at the age believed to be around her ninety-fifth year and in her sleep. Sandove the reckless as she would be known as. From the moment of her mother's death, she only made one good choice and that was the selection of a breeder almost instantly. Nine months later she gave birth to Wysadove and left her in the care of the fellow Blood Wings and led the rest one misadventure to another invading Tyedu again and again. She is said to have been killed at the Battle of Four Springs. A needless battle but a victory for the Blood Wings. After the battle, the Blood Wings gathered up their falling leader and retreated back into Jechran. The Blue Foxes near wiped out did not follow. In the interm, the Blood Wings were led by Wysadove in Myleah's eyes but in reality, there was no leader. Everyone did as they needed and helped each other. The border was secure and their land flourish. Wysadove refused to take leadership until she had proven herself. Like the 'Mother of Doves' herself. Wysadove set out with nothing and returned weeks later but not with a Jechera tooth as proof of her worth. Instead, she entered the village wearing a lion's mane and carrying a bloody wooden spear. She oversaw possibly the most peaceful history of the Blood Wings. For almost forty years the border was quiet and life was good. In this time, she took many breeders and birthed many boys and three daughters. Soldove, Luradove, and Wolsuldove. Soldove would in time seek Myleah and earned her place at the High Temple leading the guards. Luradove, would take to the seas and rumored to have charted many islands. She departed to Myleah with a small fleet of tribal ships to aid the Southern lands when Drotid attacked and is rumored to have been captured and killed along with many others. Wolsuldove would rise to power in the wake of her mother's possible death. Wysadove died in battle wearing her lion's mane and leading the Blood Wings against their mortal foes the Blue Foxes at the Battle of Two Creeks. Where Wolsuldove herself is said to have slain twenty-three warriors before no one seeing her. She was not amoung the dead or wounded. Even attempts to contact the Blue Foxes via proxies proved she was not taken captive to their knowledge. All that is known she was not there at the end. Wolsuldove, would lead from her teen years until her death. Always on the hunt for her mother's whereabouts and capturing Blue Foxes for questioning before giving them the sword and death. Blue Foxes banded with their allies and attacked. Wolsuldove was ready and in three bloody battles did what it took Sarydove the One Arm eight battles to achieve. She broke the Blue Foxes of the will and return to Jechran. There she was given breeders but only accepted one. Kevovar, he was called and believed to have been captured at sea by another tribe. She only breeds with him once and nine months later she would give birth to Suldove and Ravadove. After that Kevovar was escorted back to where he was given. Believing these were blessed days with her twins, she wasn't watching the eastern borders. The Blue Foxes had a new ally, 'The Circle' and in the eight years after the battle of that broke the Blue Foxes; they struck back with vengeance all along the border. Battles at Shallow Valley, Sunny Creek, and others were just the start. Wolsuldove's word would descend into darkness at the Battle of Thick Trees. Where 'The Circle' flanked the Blood Wings and attacked the extreme rear where the camps were. In the action that followed, several families were killed, healers and the twin's guard was killed while defending the eight-year-olds and Ravadove was killed in a brutal fashion. Suldove was taken and never seen again by her mother. Which led to countless and at times almost reckless battles led by Wolsuldove. Which went through the rest of the season and into the winter until the lands were not suitable for fighting. As spring thawed the lands. Wulsuldove led the Blood Wings into the bloodiest and most one-sided battle ever. The Battle of Frozen Creek destroyed the Blood Wings. Wolsuldove and some two hundred plus Blood Wings fought the Blue Foxes and 'The Circle' at a frozen creek inside the lands of Tyedu. Only six Blood Wings escaped the onslaught that they faced. After the battle of Frozen Creek, Myleah saw the Blood Wings dissolved. The few remaining members went to other tribal leaders and Myleah itself called for combined forces to push back the threat by the Blue Foxes and others along the border. Just as was done in the days before the Blood Wings. This page was last edited on 23 April 2019, at 06:29.